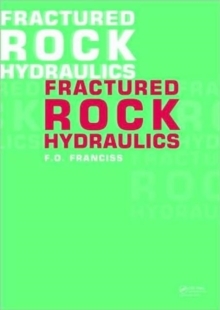 Uniquely devoted to hard and fractured rock hydraulics, this advanced-level introduction provides tools to solve practical engineering problems. Chapter I covers the fundamentals of fractured rock hydraulics under a tensor approach. Chapter II presents some key concepts about approximate solutions. Chapter III discuss a few data analysis techniques applied to groundwater modeling. Chapter IV presents unique 3D finite difference algorithms to simulate practical problems concerning the hydraulic behavior of saturated, heterogeneous and randomly fractured rock masses without restriction to the geometry and properties of their discontinuities. Supported by examples, cases, illustrations and references, this book is intended for professionals and researchers in hydrogeology, engineering geology, petroleum reservoir, rock and hydraulic engineering. Its explanatory nature allows its use as a textbook for advanced students.